If you have federal tax debt, you may be wondering if filing for bankruptcy can do anything to help your situation. You may have even heard commercials offering the hope of tax debt relief in bankruptcy, but it’s actually not that simple. Most tax debts can’t be discharged by bankruptcy. And unfortunately, if you are being audited, a bankruptcy filing won’t stop the audit – it will simply suspend any collection actions while your case is pending. The taxes in question must be federal income taxes. be at least three years ago. offer in compromise or enter into an installment agreement to settle the debt. non-priority tax debt is eligible for discharge at the end of the repayment plan. will not have to liquidate in order to pay the full amount immediately. 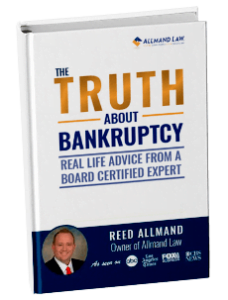 There are a number of legal issues that can arise in the bankruptcy process, so if you have old tax debt, we strongly advise you to contact a Dallas bankruptcy lawyer at Allmand Law Firm, PLLC. We are available to assess your individual situation and recommend a course of action best suited to your needs. Our bankruptcy attorney is Board Certified in Consumer Bankruptcy by the Texas Board of Legal Specialization, so you can feel confident that your case will be in excellent hands. Many debtors behind on both their mortgage and property taxes wonder if bankruptcy can be used to stop a property tax sale of their home. Fortunately for debtors facing a property tax sale of their home, bankruptcy can be used to stop the sale if they move quickly. Before filing for bankruptcy, find out if there is a property tax lien on your home. In the state of Texas, ad valorem taxes are given the highest priority of all liens and if property taxes are owed, by January 1st of each year, a lien will be placed against the home. Find out how much you owe on your property taxes before you file bankruptcy. Are you able to pay cash for this amount to have the lien removed? If it is a small amount and you need the lien removed because you are trying to sell the property you may want to consider paying off the lien immediately. However, you may not want to do this if you are considering filing Chapter 7 or Chapter 13 bankruptcy soon. Speak with your bankruptcy attorney before you pay off the property tax lien to find out how it might impact your bankruptcy case. Work with your bankruptcy attorney to determine which type of bankruptcy is a good fit for your financial circumstances. If you file a Chapter 13 bankruptcy you will have an opportunity to pay off your lien over a 3 to 5 year period. However, the lien will not be removed from your records until it is fully paid. If you decide to file Chapter 7 bankruptcy and the lien is paid off fairly quickly then you will receive the benefit of having the lien immediately removed from your records. Have More Questions About Property Taxes and Bankruptcy? If you have any questions about property taxes and bankruptcy don’t hesitate to give us a call. If you would like, you can also fill out our contact form to set up a free consultation. Can Bankruptcy Protect My Income Tax Refund? Does Bankruptcy Protect Income Tax Refunds? January through April is tax season and like many consumers you may be anticipating a tax refund. If you plan on filing bankruptcy during this time period, you may have concerns about how you can protect your refund from creditors. While many debtors may not want to disclose they are expecting a refund in fear of it being seized by the trustee, telling your bankruptcy attorney should be a priority. Whether you have filed your bankruptcy case or you are considering filing for protection sometime during tax season, you should tell your attorney you are expecting a refund. Depending on your state, you may qualify for exemptions that can protect your tax refund from creditors. Each state has a certain exemption amount that can be applied toward personal assets. Your refund may also qualify for protection if it includes a child tax credit or earned income credit. When it comes to tax refunds and filing bankruptcy it is important to review details with your attorney. If you have not filed for bankruptcy yet, you may be advised to wait until you have used your refund. It is common for tax refunds to be used to meet family needs and necessities. If you decide to withhold tax refund information from your attorney or trustee, this could result in legal consequences. Your refund could go straight to your trustee from the Internal Revenue Service if the trustee submits a request. To understand your protection options it is best to disclose to your bankruptcy attorney you are expecting a refund. In the bankruptcy case (Laroche, Wayne W. and April J.; In re), the bankruptcy court ruled that debtors filing bankruptcy must disclose their tax refund even if it is only an estimate based on previous years. In the Chapter 7 bankruptcy case the debtors failed to disclose their estimated 2008 tax refunds during the first meeting of the creditors on December 15, 2008. On February 13, 2009, the bankruptcy trustee filed her interim report noting the missing tax refund. But on March 26, 2009, the bankruptcy trustee received the debtors’ $4,420 tax return and scheduled it as an asset of the estate. However, the debtors’ tried to claim the tax return as exempt. The tax return was not exempt and was considered an asset in the bankruptcy estate. Furthermore, the debtors were required to file an estimated tax return with their bankruptcy paperwork and they failed to do so. This could have given the impression that they were attempting to hide an asset; but the bankruptcy judge recognized that it was a common error. “Although the debtors’ actions in this case are not a model for what should have occurred, their actions likewise do not rise to the point of showing that there was any intent to conceal an asset of the estate or to act in anything but good faith,” the court said. “The court’s conclusion is also based upon the widespread notion, as the court has noted in other cases such as this one, that attorneys for debtors were not aware that tax refunds were and are property of the estate. Bankruptcy and Taxes: Can I Discharge Unpaid Income Taxes in Bankruptcy? Certain income tax debt may qualify for discharge through bankruptcy but you need to have your income taxes filed. Bankruptcy and taxes: t is unlikely bankruptcy will wipe out unfiled tax debt but there are specific requirements that need to be met in order for tax debt to be successfully discharged. Chapter 7 bankruptcy may be an option to eliminate certain tax debt if it qualifies, but Chapter 13 bankruptcy may help repay what you owe with manageable payments. In determining whether or not unpaid taxes can be discharged you’ll need to review your situation and understand where you stand. Unpaid taxes often result in unfiled tax returns. One of the requirements needed in order for tax debt to be considered for discharge includes being up to date on tax filing. Chapter 7 has several requirements that include having tax returns filed for at least the last 2 years if the return was due within the last 3 years. The debt in question should also be accessed by the Internal Revenue Service (IRS) within 240 days of your bankruptcy filing. If you have yet to file your returns, you may need to seek assistance from a tax professional to get caught up and review payment options with the IRS. Another option to help you make payments on outstanding tax debt is Chapter 13 bankruptcy. In Chapter 13, a repayment plan is created based on your income and living expenses. The plan is approved by the court which may last up to 5 years; meaning the IRS is forced to settle on the payment arrangement. If you aren’t sure what to do regarding your unpaid income taxes and considering bankruptcy, you can contact us today to receive a free consultation. We are always here to help. Considering Bankruptcy and Haven’t Filed Taxes? Properly filing your taxes is an important part of making sure that your bankruptcy case goes smoothly. Failure to file taxes can end in the dismissal of your bankruptcy case, not to mention a waste of your time, money and energy. If you have not filed taxes for the past few years, you will not be able to file bankruptcy without doing so first. If you’re filing Chapter 7 bankruptcy , the bankruptcy court will usually request tax documents for at least the past two years; but they could request more. If you haven’t filed taxes for two or more years expect to have the IRS submitting a claim for payment when you do file bankruptcy. As a matter of fact, they probably have already made a tax assessment against you. However, having a tax assessment is not the same as having a tax return. The bankruptcy court demands a tax return if you want to file bankruptcy. If you’re filing for Chapter 13 bankruptcy , you will need to provide tax returns for the past four years. Once again, if you failed to file taxes do so now so that you can avoid problems with your bankruptcy case. If you are unable to pay your taxes, do not allow that to stop you from filing a tax return. The bankruptcy court does not require you to pay the taxes in order to satisfy the requirement of submitting your tax return. Finally, be prepared to repay taxes in bankruptcy especially if you did not file the tax return on time. The bankruptcy court will not discharge taxes for tax returns which are filed right before you submit the bankruptcy petition. This means that you can’t discharge taxes for 2008 if you just filed the tax return in 2011. Tax liens and other types of liens do remain after a bankruptcy discharge; however, they do not attach to any property acquired after your bankruptcy discharge. The tax lien was filed too soon or the filing of the tax lien failed to follow IRS procedures. You entered into an installment agreement to pay the tax debt once your received the notice of a tax lien. If the tax debt was not discharged in bankruptcy and withdrawal of the tax lien will enable you to pay the tax debt quicker. A Taxpayer Advocate has determined that the withdrawal of the tax lien would be in your best interest or the IRS has determined that the withdrawal of the tax lien will be in the best interest of the government. You had already paid the tax debt owed before the IRS filed the lien. The tax lien was filed while you were in bankruptcy and were protected by theautomatic stay . The statue of limitations for collecting the tax debt expired at the time the lien was filed. You did not have an opportunity to dispute the assessed tax liability. It’s important to remember that after 10 years a tax lien expires unless it is renewed by the IRS, in the case of a tax lien. Also, the IRS may be willing to release a tax lien if you are trying to sell your home. Have More Questions About Tax Liens and Bankruptcy? If you have any questions about tax liens and bankruptcy we are always willing to help. Submit your questions here and or set up a free consultation and we will get back to you. Eliminating certain types of debt through a discharge is one of the hallmarks of the bankruptcy process. A debt discharge will eliminate your personal obligation to pay a debt, which can free resources and provide the financial fresh start you need to get a hold of your finances and find stability in your future. Because many people are aware that a debt discharge exists at the end of a Chapter 7 or Chapter 13 bankruptcy case, but may not be certain as to how it specifically works or what debts it can discharge, our Dallas bankruptcy lawyers at Allmand Law Firm, PLLC work closely with clients to educate them about the process, the laws, and what applies to their unique situation. For the most part, our Dallas Bankruptcy Law Firm always explain that unsecured debts are dischargeable in bankruptcy, the most common of which is credit card debt. Secured debts, on the other hand, are not. These debts backed by collateral include home mortgages and car loans, and they are voluntarily incurred. Liens, however, are involuntary debts, and they imposed by law. Most tax liens cannot be discharged in bankruptcy, including federal tax liens, which means you will continue to owe them at the end of a Chapter 7 case, or repay them in full as part of your payment plan in a Chapter 13 case. Bankruptcy unfortunately does not wipe out tax liens recorded prior to filing. While a debt may be wiped out, a lien on your property that is recorded prior to filing will remain on the property. Because issues involving tax liens and bankruptcy can be complex, and because your options depend largely on the unique facts of your situation, it is best to review the details of your finances and goals with an Bankruptcy Law Firm who has experience guiding clients through the bankruptcy process. Our legal team at Allmand Law Firm, PLLC do precisely that, and our Dallas Bankruptcy Law Firm is readily available to provide you with a free case review to review your options and discuss what we can do to help. It’s tax season again and many of you may be considering bankruptcy. If you receive a tax refund after you file bankruptcy, that refund may become part of the bankruptcy estate. What that means is that the bankruptcy trustee can use your tax refund to repay creditors, even if you filed a Chapter 7 bankruptcy. Your tax refund may be able to receive protection by using a bankruptcy exemption, if it is small enough. This is something you need to discuss with your bankruptcy attorney because he/she may decide that your bankruptcy exemptions are better suited protecting other, more important assets. If you file your taxes and receive your tax refund before filing bankruptcy your tax refund might not be considered as part of the bankruptcy estate. This will be determined by how much of a tax refund you received and when you received it. For example, if you received a $5,000 tax refund a few days before you filed bankruptcy, that money may still be considered part of the bankruptcy estate. Also, if you have unusually large tax refunds, a bankruptcy trustee may decide that you are attempting to hide assets via taxes. On the other hand, if you received a $300 tax refund, six months before you filed bankruptcy and spent the money on bills and other necessities, the tax refund would not be considered part of the bankruptcy estate. Because this area of the law came sometimes become murky, it is best to discuss your tax refund and bankruptcy with a qualified bankruptcy attorney. Debtors filing bankruptcy must disclose any tax refund they are planning to receive. Failure to disclose a tax refund can cause your bankruptcy case to be dismissed. A bankruptcy trustee has the power to direct the IRS to send your tax refund directly to the bankruptcy court. When it comes to tax debt , most of us believe that the only way to get the IRS off our backs is to grit our teeth and pony up the penalties. However, while common wisdom may indicate that the only certainty in life is death and taxes, that isn’t always the case – especially if you resort to filing for bankruptcy to solve your tax problems. While bankruptcy cannot eliminate some debts owed to the federal government, there are several types of taxes that can be eliminated under a Chapter 7 or Chapter 13 bankruptcy . The types of taxes that can be discharged through bankruptcy will depend on whether you file for Chapter 7 or Chapter 13 bankruptcy. For the taxes that you can’t discharge through a Chapter 7 bankruptcy (these will likely be your most recent bill to the IRS), you might be able to pay them off through a Chapter 13 bankruptcy without being penalized with interest payments. Be sure to talk to your bankruptcy attorney about which bankruptcy option is the right one for your specific financial predicament. While the type of taxes owed will ultimately determine if they can be dismissed, the general rule of discharging taxes via bankruptcy is this: if you faithfully filed honest and detailed income taxes, and the taxes owed are older than three years from the date of your bankruptcy, then the courts can discharge these debts. However, take note that the IRS will go through your old tax returns with a fine-tooth comb – therefore, if they discover any inaccuracies or dishonesty in your tax returns, you’ll lose your right to discharge your old tax debts. Keep note that your tax returns could end up getting your bankruptcy petition dismissed. If you file your tax return late – or fail to file one at all – during the course of your bankruptcy petition, you could end up seeing your case entirely dismissed. So whatever you do, stay on top of your tax return. Bankruptcy could be the ultimate solution to your tax problems. Talk to your bankruptcy attorney today to see if it’s the right solution for your financial situation. There are various advertisements on television and radio that encourage consumers to utilize special services aimed at getting rid of tax debt through bankruptcy. Keep in mind the process may not be as easy as they make it sound. Some tax debts may not qualify for elimination in bankruptcy (Chapter 7), but they may qualify for inclusion of a repayment plan (Chapter 13) to help you manage them better. Bankruptcy may be able to help you deal with tax debt, but no matter your financial situation, there are things you should know about tax debt and bankruptcy. To get further details discuss the matter with a qualified bankruptcy attorney or tax specialist. to fraud penalties or payroll may not be discharged. be found to evade or avoid filing tax returns. other words, the tax debt should have been due 3 years prior to your bankruptcy filing. your tax returns are filed. In a recent Chapter 13 bankruptcy case, the bankruptcy court was faced with the issue of how to apply interest on tax debt in a repayment plan. As stated in the Trustee’s original motion filed in each case to modify the subject claims, Debtors’ respective proposed Chapter 13 plans and their Orders of Confirmation provided for payment of Creditors’ claims without interest. Creditors’ proofs of claim, in stark contrast, provided for 24% interest. In response to the Trustee’s objection filed in each case to pay Creditors’ claims at a significantly reduced interest rate in accordance with Till v. SCS Credit Corporation, 541 U.S. 465, 479 (2004) (holding that the “prime-plus” or formula approach best equates with the “present value” requirement of the Chapter 13 “cram down” bankruptcy provision for allowed secured claims codified in § 1325(a)(5)(B)(ii)), Creditors unsuccessfully argued that their claims were shielded by the anti-modification protections of § 511(a), which was enacted as part of the Bankruptcy Abuse Prevention and Consumer Protection Act of 2005 (“BAPCPA”). There is an important distinction to be made in this Chapter 13 bankruptcy case. Section 511(a) of the bankruptcy code specifically states that tax claims are exempt from modifications to their interest rate. This may include tax claims which have been acquired by third-parties depending on the state in which the bankruptcy is filed. In the state of Texas, if a third-party acquires a tax lien, that debt retains its secured and priority status, including the protection from “cram downs” in bankruptcy. However, any interest rate applied to tax debt held by the state or by third-party creditors must be justified. In other words, a creditor cannot simply tack on whatever amount of interest they choose in Chapter 13 bankruptcy. Dealing with income tax debt can be frustrating and for some, overwhelming. Bankruptcy has been known to help deal with credit card debt , medical bills and even helping people keep their homes, and the process may help with income tax debt. It’s not uncommon for consumers to ask about bankruptcy and how it can help them deal with the IRS. Can Bankruptcy Discharge My Tax Debt? The tax debt is accessed by the IRS at least 240 days before bankruptcy filing. The debt in question is income taxes and it is at least 3 years old. Tax returns were filed for the past 2 years before filing for bankruptcy. No tax fraud or evasion has been committed. Is Bankruptcy an Option for Tax Settlement? This often depends on your situation. If a Chapter 7 bankruptcy isn’t an option, a Chapter 13 could be another solution depending on qualifications. Does Bankruptcy Remove Tax Liens? Chapter 13 can help remove tax liens under the repayment structure. Once you successfully pay the amount under the plan the lien can be removed. Removing a lien under Chapter 7 may be challenging unless there is a solution to satisfy the lien. What if I Don’t Qualify to Have My Tax Debt Discharged in Chapter 7? A Chapter 13 bankruptcy may allow you to make payments based on your ability. The IRS also offers different solutions to help settle your debt including Offer in Compromise and installment payments. Review your situation with a qualified attorney to learn if bankruptcy is the option for you.